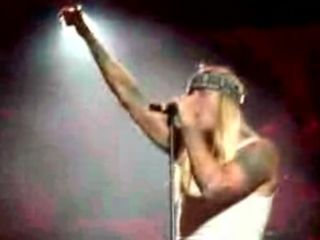 Chester Bennington or Bret Michaels? Linkin Park are very good at being Linkin Park. As Guns N' Roses, not so good. During a show at Alpine Valley on Saturday night, singer Chester Bennington inexplicably donned a blonde wig - making him look more like Poison's Bret Michaels than Axl Rose - and he and the rest of Linkin Park butchered the Guns N' Roses hit Sweet Child O' Mine. If this was Linkin Park's idea of a joke, well, the humor is in the eye (and ear) of the beholder. Here's the video. Judge for yourself. All MusicRadar can say is, the Guns N' Roses cover bands of the world can sleep soundly.